On Monday morning, President Obama signed an executive LGBT non-discrimination order, barring discrimination on the basis of sexual orientation or gender identity among federal contractors. The order also protects all federal employees from discrimination on the basis of gender identity. Crucially, Obama did not include the broad religious exemption that some faith leaders had begged the White House for. (These requested exemptions would have allowed religiously affiliated corporations to fire gay and trans workers with impunity.) The executive order does, however, preserve a Bush-era exemption that allows religiously affiliated contractors to continue to preference workers of a certain religion. The president’s action on job discrimination is probably his biggest single gay rights accomplishment since signing the repeal of “don’t ask, don’t tell.” As the gay marriage battle draws to a close, Obama repeatedly targeted LGBT job discrimination as the next frontier of gay rights, urging Congress to outlaw it through federal legislation. But the Republican-controlled House has refused to countenace any sort of LGBT non-discrimination law, even after a bipartisan coalition pushed a weak bill through the Senate. That bill recently lost support from gay rights groups in the wake of Hobby Lobby thanks to its broad religious exemptions, officially flat-lining the effort for the foreseeable future. Obama’s executive order won’t help nearly as many workers as federal legislation would, though it’s estimated that his ordinance will protect an impressive 20 percent of the American labor force. His order is also a moral victory for the LGBTQ movement, which fretted that Hobby Lobby would lead to a new era of discrimination under the guise of religious liberty. Although the debate over religious exemptions remains fierce and unsettled, Obama’s refusal to hand religiously affiliated companies a special license to discriminate suggests his administration has not bought into the notion that legalizing bigotry is necessary to preserve religious freedom. Ally, 3, Mark, Lincoln, 7 weeks, and Jane Brown at home in Blacktown. IVF patients are set to save thousands with a new cut-price clinic offering to bulk-bill almost all services. Primary Health Care, Australia’s largest medical centre provider, has chosen Sydney to open its first bulk-billing IVF clinic, which will slash the average out-of-pocket expenses for patients to about $500 compared with the average gap of $4000 in private clinics. The IVF clinic, which opens today at Town Hall in Sydney’s CBD, has already had 300 inquiries. University of NSW figures show there were more than 61,000 IVF cycles in Australia in 2011. The average cost for treatment is about $8000 with between $3000 and $4000 covered by Medicare. Primary Health Care chief executive Dr Edmund Bateman said with 60 medical clinics and 150 diagnostic practices nationwide, it was big enough to offer bulk-billed IVF treatment and absorb any additional costs instead of passing it on to patients. “If the medical procedure has an item number (with Medicare) we will bulk-bill it and you will pay nothing for it,” Dr Bateman said. Patients would still be charged for services not covered by Medicare such as the freezing of embryos and day surgery, which are expected to cost no more than $500. 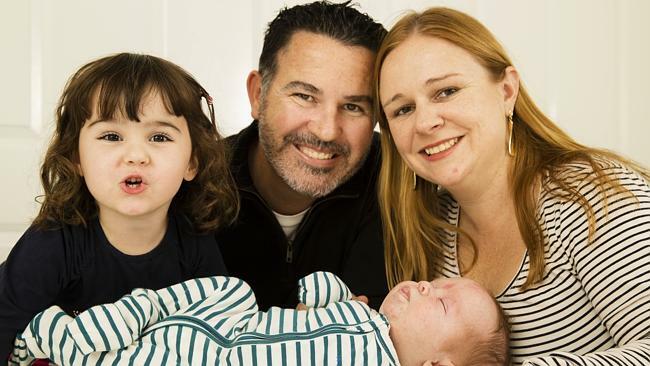 Blacktown mum Jane Brown, 37, who used IVF treatment to conceive her two children, Ally, 3 and Lincoln, seven weeks, said bulk-billed fertility treatments would be amazing for “average families,” like hers. Ms Brown and her husband Mark paid about $5000 each for six IVF cycles over eight years to conceive their two children. “We are still paying for it now but in the long run it is worth it of course,” Ms Brown said. Infertility support group Access Australia chief executive Dr Sandra Dill was cautiously optimistic of the bulk-billing clinic. “If it is true there would be greater equity of access for treatment because there won’t be any additional costs,” Ms Dill said. Ms Dill said IVF was a huge burden for many couples. Dr Bateman said the IVF clinic had the staff and resources to conduct 5000 cycles are year but could double that if there was a greater demand. Who is your mother? Is she the woman who gave birth to you -- the woman who is genetically related to you -- or the woman who intends for you to be born and plans to take up parental responsibility as outlined in the Children's Act? Under section 23, parental responsibility means all the duties, rights, powers, responsibilities and authority which by law a parent has in relation to the child. This includes the duty to maintain the child and to provide him with an adequate diet, shelter, clothing, medical care, education and guidance and protect the child from neglect, discrimination and abuse. Hospitals have to indicate the mother's particulars and name on the notification of birth slip and the registrar of births and deaths has to issue a birth certificate when a child is born. However, there is a dilemma when it comes to registering surrogate children and the recognition of surrogacy agreements. Whereas the status of motherhood used to be "self-evident" by the pregnancy and birth of a child, new reproductive techniques (discussed in last week's article) have evolved in recent years ahead of jurisprudence, thereby complicating and overwhelming the issue of maternal and reproductive health rights.This means that there is a gap in the Kenyan laws since the laws do not directly address these emerging forms of parenthood. In surrogacy arrangements, there are potentially three different players with different maternal rights: the donor who supplied the ovum, the woman who gestated and gave birth to the child, and the woman for whom the child was intended. The genetic rule is based on the view that a woman's genetic contribution to a child is the most determinative factor while the gestational maternity rule is primarily based on the emotional and physical connection developed during pregnancy. The intent based maternity rule is based on the fact that at the beginning of every surrogacy arrangement, the commissioning mother has the preconception intent to raise the child and the surrogate mother has the intent to surrender the child. We must not lose sight of the fact that under the constitution at Article 26, life begins at inception. On June 30, a monumental judgment was delivered by Justice Majanja setting the precedent on how surrogacy arrangements and the conception of motherhood will be adjudicated in Kenya given that Parliament has yet to legislate or develop policy on this matter. The rules on how a child gets Swedish citizenship at birth will be changed so that women and men are treated equal. This means that a child will always be a Swedish citizen at birth if one parent has it. Changes to the Law on Marriage and Family will allow close relatives to become surrogate mothers. Duong Dang Hue, director of the Civil and Economic Department at the Ministry of Justice explains the new reforms. Surrogacy has been illegal in Viet Nam for many years, why does MoJ want to revise the Law on Marriage and Family to lift the ban? The revised law we are drafting will include an article on surrogacy for humanitarian purposes. The idea itself originated with direct requests from the Vietnamese people. In Vietnamese culture, many families consider it important to have children to continue the family name. In the north, it is not as important, but in the south, it is. It is unfortunate that in our society, a number couples do not have the ability to reproduce and have children of their own. It is especially unfortunate when they themselves are an only child. Many couples in need of surrogacy have resorted to asking hospitals for permission to engage in surrogacy. Many doctors reading these letters have felt the pain of these couples and want to help them, but do not want to break the law. This led to a number of doctors submitting a request to MoJ to consider the issue on humanitarian grounds. I myself fully support the proposal. Surrogacy is the best solution to this heart wrenching problem and is of humanitarian significance. For women unable to have children, it gives them a chance to experience motherhood. Don't you think that if surrogacy is legalised, some people will abuse the law to make money? Yes, quite a few people have expressed concerns about this. In my opinion, these allegations are not substantial. Despite the current ban, breaches are occurring. By legalising surrogacy, we can prevent harmful practices taking place in the shadows and ensure the infants of surrogate couples are receiving appropriate attention from doctors, even in the early stages of pregnancy. This is good for babies and surrogates and we can address health complications as they arise throughout the pregnancy. Will the new law stipulate conditions on who is eligible for surrogacy and to be a surrogate? Absolutely, the law will provide the requirements for eligible couples and eligible surrogate mothers. Here I just want to reiterate that surrogacy will only be granted to couples where the wives, for health reasons, are physically incapable of having children. Eligible surrogates must be between the ages of 21 and 40 and be healthy. They must already have at least one child. Most importantly, the two parties must consent that the planned surrogacy is solely for humanitarian purposes and not for financial gain. The draft law will also stipulate that the surrogate mother must be a relative of either the husband or wife. In the event the couple cannot find any willing relatives, they may ask a non-relative woman. Do you think this is unreasonable? Yes, during the drafting process we touched on this issue. We acknowledged there were pros and cons ideas of requiring the surrogate mother to be a relative. However, my own position is consistent with the policy's requirements. I favour the notion that the surrogate mother must be a relative, for two reasons. First, to minimise the risk of commercialising surrogacy and second, to ensure the surrogate is more likely to empathise with the couple's desire to have children of their own. and sleepless nights you have endured! and kindness you have shown! in the never ending fight for the best for your patients!! !